Yes we raised the money and are currently having a stand hand-crafted for it. We are dedicating the Bell on Armistice Day at St Mary’s Shincliffe. Next year will see the centenary of the armistice that ended the slaughter of the First World War. 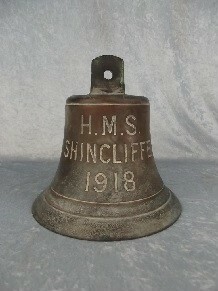 To mark this anniversary; 11th November 2018; we are hoping to raise around £2000 in order to purchase the original ships bell of HMS Shincliffe. During the course of that ‘Great War’, as it become known, the Admiralty commissioned the building of 32 “Racecourse-Class” coastal paddle-driven minesweeping sloops under the Emergency War Programme. Also known as Ascot Class Minesweepers, they were all named after racecourses around the UK. They all saw active service and at one time found and destroyed 53 German mines in a period of five months. If you are into walking or rambling or just like a pleasant stroll in the countryside and you go on the internet and google ‘This is Durham’ you will find a number of walks in and around Durham. This walk takes you into Strawberry Lane and crosses the site of what was Shincliffe Racecourse which opened in May 1895 and closed with the advent of the First World War. When it re-opened in 1918 it failed to draw the crowds and closed permanently in 1919, almost certainly due to the great loss of life caused during the war. Further attempts were made to re-open the course but all that is left now is some of the grandstand stepping within one of the barns on the farm. HMS Shincliffe was named after the racecourse. She was launched on 29 January 1918 and was amongst the last eight improved type which saw active service during the last few months of the war and also in the years of mine clearance following the armistice. We believe she patrolled Auxiliary Area 16, from Oban in North West Scotland and as far south as Liverpool in The Irish Sea. She was equipped with 2 x 6pdr-guns and 2 x 2-pdr pom pom. Had a crew of 52. She was known to be one of 13 paddle minesweepers lying off Rosyth as ‘Paid Off’ ready for sale or scrap in January 1921. As happens to all redundant naval vessels, her bell was placed in a naval store. It recently came up for sale in a Portsmouth antique shop which specialises in nautical memorabilia. A local Shincliffe resident, who happened to be going on holiday via Portsmouth, has paid a deposit to reserve the bell for the next three months. It is hoped that funds will be raised during this time, by our community, to complete the purchase at a price of £1500 with a further £500 to enable restoration and for the mounting or hanging of the bell. St Mary’s Parochial Church Council has approved the purchase of the bell and it is hoped that it will be permanently displayed within the Church in Shincliffe Village and that it will be rung on Armistice Day 11 November 2018 and on other special occasions. A small fund raising and research committee has been formed to ensure that this unique historical artefact is indeed secured for Shincliffe. A history of the ship is also being prepared. Saturday 28th October 2017 at 7pm. Tickets are priced at £10 each to include refreshments,to be served in the Church Hall. Tickets available from Stuart Forster 0191-908-5020 or Nigel Jackson 0191-384-9932. If you are not able to attend the event but would like to make a donation, then please make cheques payable to St Mary’s Church, Shincliffe.